Cut each fresh strawberry in 3 pieces. Cut each brownie in 4 cubes. Slide a piece of strawberry on the skewer, followed by 1 cube of brownie. Repeat this step to form 4 kebabs. Try adding pieces of banana or marshmallows. With the spring and summer heat comes the craving to eat fresh and seasonal fruits, which are perfect in wholesome snacks. Of course, not all kids are going to be crazy about fruit, but if we win them over with a colorful and fun treat, they’re guaranteed to ask for fruit everyday! 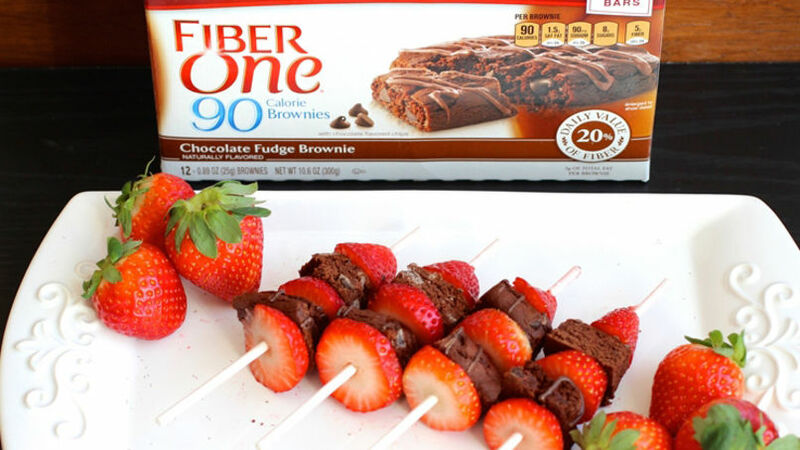 Today, I want to share one such delicious and simple snack idea; you only need two ingredients to assemble these strawberry and Fiber One™ kebabs. The ideal afterschool snack or treat for kids’ parties!